Sometimes the best way to bridge a culture gap is to fill it with laughs. Last spring, Jesse Appell ’12 landed a Fulbright fellowship, becoming one of a small number of research fellows sent around the globe by the State Department to foster understanding between the U.S. and other countries. 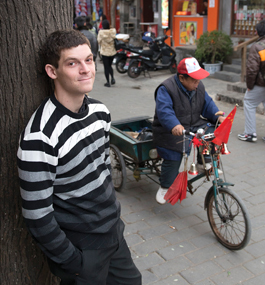 Appell’s Fulbright project — exploring what tickles China’s funny bone — comes as a surprise to no one who knew him at Brandeis. Not only did he major in East Asian studies, and international and global studies, he spent countless evenings performing improv at Chum’s. Now living in Beijing, Appell is learning a traditional form of Chinese comedy called xiang­sheng, sometimes translated as “cross talk” (think Abbott and Costello’s “Who’s on First?” sketch). He has apprenticed himself to one of China’s foremost xiangsheng masters, 69-year-old actor Ding Guangquan. But no training could have prepared the Newton, Mass., native for the Chinese response to his own comedic adventures. As a Fulbright scholar, I’m getting the chance to take comedy seriously. Still, it has taken some mental adjustment to accept that endlessly watching old xiangsheng performances on the Internet, lavishing long stretches of time on learning Shandong opera, and attending comedy workshops actually passes for productive behavior. It seems the only thing the Fulbright program didn’t prepare me for was a real vacation. Last fall, China’s national holiday emptied Beijing and put the whole country on pause for a week, freeing up more time than I knew what to do with. Somewhere in between some strenuous eating, sleeping and reading, I got a text from Wenchao, my go-to person when I want to know what was popular in China two months ago. “Gangnam Style,” of course, is the Korean music video viewed more than a billion times on YouTube, making it the most-watched video of all time. In it, Psy, a K-pop singer with flashy clothes and silly dance moves, rides an invisible horse around Gangnam, a posh Seoul district. Since the video has inspired countless parodies on the Internet, I wasn’t immediately keen on adding my own. I typed an offhand reply — “Yeah, I should do Laowai Style!” — and pressed the send button. Laowai is the term the Chinese use for foreigners they think don’t understand them. It’s typically used to describe foreigners who have fancy jobs; make lots of money; seduce beautiful, younger Chinese women; and pay more for a single drink than the average Chinese worker makes in a day. LAUGH TRACK: Appell went from studying comedy in China on a Fulbright to an unexpected star turn on Chinese websites and TV. Then I paused. Actually, I should do “Laowai Style,” I thought. After all, being silly is one of my favorite pastimes in China. In a place where the natives are generally terrified to stand out or openly flout convention, being silly in public makes me feel a lot more American — and more at home. But I had another agenda as well. This was a perfect chance to show there is more than one type of laowai in China. During lunch in a restaurant, I wrote some lyrics in Chinese while slurping a bowl of noodles, eliciting stares as I took up a whole table, my laptop, food and chopsticks all flying in and out of my hands. Just a regular guy who’s a laowai. I’m that kind of laowai. Next, I made an audio recording of “Laowai Style” in my living room, thoroughly confusing the Chinese family who lived one thin wall away. Now I had to find some “dancers” to perform the song with me in a video. I contacted my various networks, including my fellow China Fulbright scholars. I figured anyone who could write a grant proposal that danced around topics sensitive to Beijing would be willing to dance around Beijing itself. At 9 a.m. the next day, eight of my friends met me at the Tsinghua University campus. Over the next 15 hours, we traversed vast swaths of the city, setting up our camera tripod near some of Beijing’s most famous landmarks. We hopped our horse dance outside the picturesque Bird’s Nest Olympic stadium; in the shadow of the Drum Tower, resplendent in red and gold filigree; and all over Tsinghua’s beautiful campus, veined with small rivers and marble bridges, and dotted with willow trees. Taking pictures and putting them on Weibo. Beijing, this city, I don’t want to leave. So many good Chinese friends. CATBIRD SEAT: Appell and his Gangnam-esque dancers attract an audience while videotaping outside Beijing’s Bird’s Nest Olympic stadium. Of course, a group of foreigners dancing and singing in public is quite a spectacle in Beijing. Everywhere we went, we drew crowds. At Tsinghua, a group of elementary-school girls stopped and stared wide-eyed at my strange crew, who wore mismatched outfits and campy sunglasses. I managed to convince the kids and their teacher to dance with us for the video. Even though a line of hopping 8-year-olds was not in the original storyboard, their dance was my favorite part of the whole day. At the Olympic stadium, a crowd of about 300 curious onlookers formed a massive arc around our impromptu performance. Some snapped pictures with their cameras and phones; some snickered with their friends; and some simply gazed in silence, their eyebrows knotted in confusion. Play with me; come on and play with me. IN THE SPOTLIGHT: An appearance on a Beijing Television program brought “Laowai Style” to millions of viewers. At that, a huge wave of sound erupted, and the crowd mobbed us. Young Chinese girls rushed forward, asking to take a picture with us and exchange phone numbers, and expressing disbelief when they heard what my job was. “The American government is paying you to research Chinese comedy?” they asked. “And I’m hard at work,” I replied. That night when I collapsed into bed, I realized there was something special in the interest the passersby had shown us while we filmed, something that cut across gender and generation. They were curious about us in the way I was curious about them. The Chinese were trying to understand this foreign humor I had brought to the streets of Beijing. I love Beijing. Sometimes, when the streets are dirty and the air is especially smoggy, it’s easy to wonder whether the feeling is mutual. But I had just spent a day singing a love song to this city, and the city sang it back. The following week, on Thursday, I uploaded the finished video to Youku, China’s version of YouTube, before heading to my daily language classes at Tsinghua. When I came back from class, I saw the video already had 5,000 views, more than I had expected it would get in total. By dinnertime, the video had tallied 20,000 views and jumped to the front page of Youku. By Friday night, there were more than 100,000 views and 400 comments. By the end of the weekend, the video had a staggering 300,000 views and more than 1,000 comments. On Sunday night, out of curiosity, I googled “Laowai Style” on Baidu, the largest search engine in China. I discovered there were 60 copies of my video online. People had stolen the video and uploaded it on different video websites; Youku alone had 10 copies. It was then I knew I had made it in China — I had created something worthy of being ripped off. If you counted all the views of all the videos, “Laowai Style” had been seen by more than a million people in four days. The next week, my email inbox exploded. Suddenly, I was an Internet celebrity. “Laowai Style” made it onto the Chinese evening news. Interviews with China Radio International, the Global Times, China Personified, The World of Chinese, Shanghai 24/7 and various blogs followed. The Global Times even named me one of its People of 2012. The Fulbright Foundation posted a piece on me on its website. “The last person we highlighted saved the lives of six Indian children with cleft palates,” the Fulbright officer told me, describing the kind of stories they usually publish. I nodded. “I danced on an invisible horse in public,” I said. “Laowai Style” was manna from heaven for Chinese television, which seems to have an entire subgenre dedicated to foreigners dancing and singing in front of the camera. I was soon inundated with requests to perform the piece live in a studio. 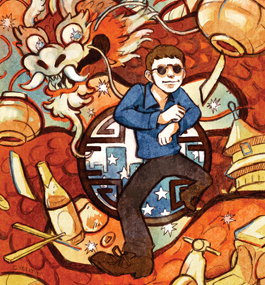 When an Anhui Television show called “Can’t Stop Me Now” contacted me, my interest was piqued. However, not long into my meeting with Ms. Chen, the show’s director, it became clear there were some points of contention. “What kind of changes?” I asked, wondering if the phrase “the Party” or “Chinese characteristics” might pop up in some new lyrics. I smiled wide — a genuine smile, because in that moment my afternoon had gone from a business meeting to an exercise in gathering funny blog material. “I think that might change the meaning a bit,” I observed evenly. “Don’t worry about that,” said Ms. Chen. We agreed to consider changes, which in China means that both of us knew that neither of us would be considering anything. Moving the conversation along, I mentioned I had made more funny videos back in the U.S.
“Let me see your funniest one!” Ms. Chen said. Almost all the videos were in English, I told her. Would this be a problem? “No problem!” Ms. Chen assured me. But of course it was. I’ve spent enough time struggling to understand Chinese comedy to know that 90 percent of my jokes would die in linguistic and cultural transit. How would Otto von Bismarck rapping about “The Federation of the Rhyme” be funny to the Chinese? “I don’t know if I have other videos that would fit a Chinese sense of humor,” I said. I nodded. I knew where this road led. In the end, my relationship with Anhui Television deteriorated, creating an opening for a much better gig: BTV. 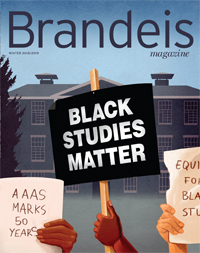 No, not Brandeis Television. Beijing Television. On a freezing November morning, I found myself with 20 friends, representing a half-dozen nations, in a dance studio an hour south of Beijing, in the middle of nowhere. Beijing Television had invited us to tape a giant “Laowai Style” production number for national broadcast. If they were going to invest so much in our performance, we needed to learn some real dance moves from a real dance tutor. For the next four hours, my friends and I struggled to follow the moves of our dance instructor, Zhu Zhu, who moved remarkably gracefully, wearing a pair of knockoff Uggs with tufts of pink fur at the ankle and a black puffy vest. I felt foolish as I attempted to replicate the gyrations Zhu Zhu made seem so natural while I sang “Laowai Style,” learning which words corresponded to which steps. The day of the shoot went by in a blur. The stage was 60 feet wide and backlit by sapphire-colored lights. A studio audience of several hundred had gathered to watch. For a moment, I was clutched by fear. I tried to smile, but my lips trembled. I was terrified I might misstep. Then I remembered. I spoke Chinese, a language of 10,000 symbols. I was standing on a glowing stage 6,000 miles from my home. I was surrounded by supportive people from the four corners of the earth. My drive to learn, experience and share comedy had directed me here. The next steps on my path were the steps of the dance, pounding a road I was the first to travel, leading me to places I could never have imagined before I came to Beijing. To see Jesse Appell’s original “Laowai Style” video as well as his Beijing Television performance, go to his website, www.laughbeijing.com.